2nd Annual Angling for Alstrom is August 4th! The morning kickoff in 2011! Gina Denbow has done it again. While being a full time mother and teacher, she has managed to pull together one of the highlights of my summer: The 2nd Annual Angling for Alstrom bass tournament in Woodlands, ME! As an avid fisherman and a volunteer for Alstrom Syndrome International, this is an exceptionally exciting event for me. It brings together so much of the community, offers so much for so many, and ends with a chow enough to make a king happy! All this while raising money to help ASI. What could be better? Kate’s Kids, headed up by Gina’s daughter and our friend Kate Denbow, insures that children will also have a chance to demonstrate their angling skills, with kids vying for trophies, medals, and the chance to be number one for the day! In addition, new this year, the Cardboard Boat Race!!! Last year’s tourney was an amazing time, and everyone went home with a great sense of accomplishment from a day well spent. With proud sponsors such as the Boston Red Sox, Cabela’s, Old Town Canoe, and the hosts of the tournament, The Maine Blade Runners, this second tourney is sure to be a kick in the pants! 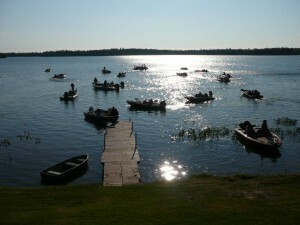 The tournament and festivities will take place on Grand Falls Flowage, Woodlands, ME. Contact information is available on the event flyer. Take a look at the flyer for the tourney, and rules for the Cardboard Boat Race! This entry was posted in Announcements, ASI Family Events, ASI News, News by Tony Jackson. Bookmark the permalink. You have given me waaayyyy too much credit!! There are many friends and family members, along with the Maine Blade Runners and ASI volunteers (Tony, Mike, Jon, Phyllis) that made last year’s event a success and this year’s even possible! I can’t wait until August 4 to see the cardboard boats and canoe challenge (I plan to register for this! ), and all the friends that will gather on The Flowage for a fun-filled day raising money for ASI. And I can’t wait for the food, um, I mean, seeing so many wonderful friends and family out for a great cause! Looking forward to seeing Dangerous Dave out of his CA element to share in the festivities!